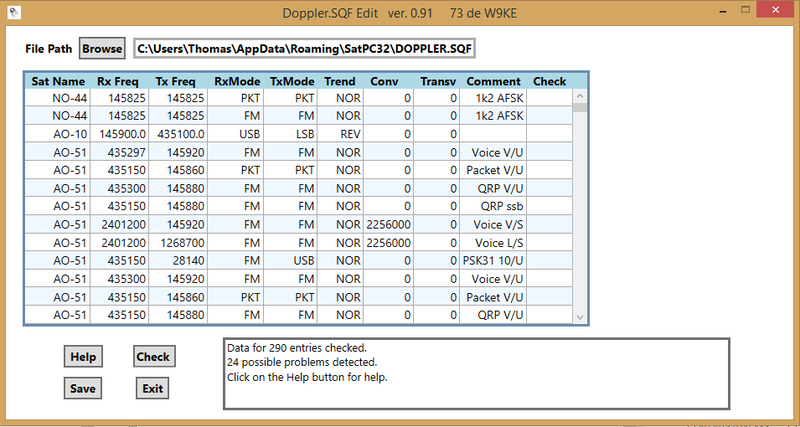 Doppler.Sqf Editor is a simple program designed to easily edit and check doppler.sqf files used in SatPC32. It runs on Windows 7 and Windows 8/8.1 and uses .NET. It is a stand alone .exe file so no install is necessary. Unzip the file and then run the .exe file. Ignore any warning messages from Windows. Be sure to read the SatPC32 manual on the Doppler.Sqf file. Click on the 'Help' button to display the instructions on how to use the program and then read them.